I spent many hours reading books that appeal to my older children. However, there is nothing quite like the joy of a good picture book. I thought I would share a few recent favorites. 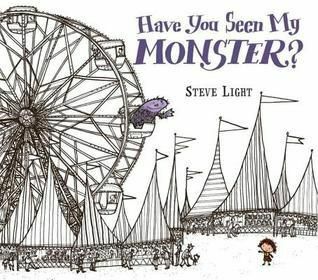 Have You Seen My Monster (Steve Light, 2015) is the choice of my three year old daughter, Martha. This story takes us to the county fair with a little girl. The little girl is in search of her monster. From the carousel to the fun house, she is looking high and low for her monster. As we help her search for her monster, we learn about twenty different shapes along the way. The shapes include common shapes like rectangles and ovals. It also introduces children to trapeziums and heptagons. The black and white illustrations with splashes of colored shapes work well with this simple tale. Little ones can easily locate the monster that seems one step ahead of the little girl. All ends well as the little girl leaves the fair holding the hand of her monster. I asked Martha why she liked this story. She liked the little girl sharing her mom and dad with the monster. The monster did not have a mom and dad. Martha enjoyed the simply looking at the illustrations and perhaps creating her own story for the little girl and monster. While this book is looked at often, rarely am I asked to read it. I think the illustrations are the winner for this picture book. 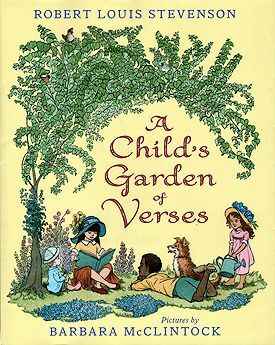 A Child’s Garden of Verses (Robert Louis Stevenson) is constantly in the hands of my five year old, Sam. This edition of Stevenson wonderful collections of poems is illustrated by Barbara McClintock (2011). Sam looks at this book often and can tell you all his favorite illustrations. I asked him why he selected this book as a favorite and he said, “Well, it has poems. And I like the picture of the boy in bed and all the toy soldiers.” The Land of Counterpane would be the poem that is home to his favorite illustration. It should be noted that he did bookmark the poem, Pirate Story as well. With a basket full of newly published picture books, I love that he selected A Child’s Garden of Verses. I think he has excellent taste. 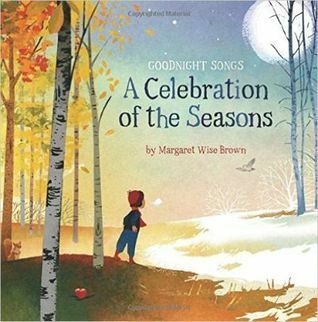 Goodnight Songs: A Celebration of the Seasons (Maragaret Wise Brown, 2015) was the book choice of my daughter, Sarah (7). This is a collection of songs about nature that young children will love. Simple and beautiful. My daughter’s favorite selection was Advice to Bunnies. Twelve different artists illustrated the songs which comes together to give a nice range of engaging artwork. Our library copy also included a CD of twelve different artist singing the various songs included in the book. While we enjoyed these selections as poems, the CD would work beautifully during nap time or rest time to give a calming atmosphere. If you utilize memory work in your home or classroom, these could be wonderful additions to the memory box. The illustrations by Randy Cecil meld perfectly with the lyrical text. You can’t help but delight in the Little Girl and Dragon. My nine year old daughter, Hannah, said that I should share this book with you. Why? 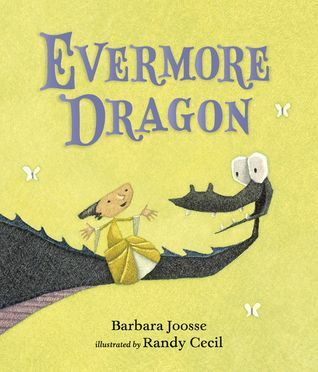 Because everyone loves a dragon story; young or old. 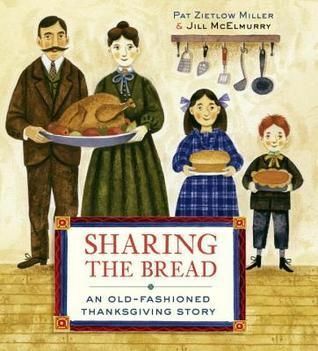 And one final book selection for you today, Sharing the Bread: An Old-Fashioned Thanksgiving Story (Pat Zietlow Miller & Jill McElmurry, 2015). Simple rhyming text and colorful illustrations bring us the story of a 19th century family coming together to celebrate Thanksgiving. From Grandma baking her pumpkin pie to the son folding pilgrims hat, everyone helps to get a feast upon the table. A lovely celebration of family, fellowship, and thanksgiving that everyone will enjoy and appreciate. “Family, find your dining place. Choose a chair and fill your space. Bow your heads and ask for grace. One of my older children said that I should share this book with you. Why? It is a sweet story that has nice pictures. Lydia had just finished reading it to our youngest one who loved looking along. This is the perfect season to read Sharing the Bread with your young ones. It might be fun after reading to create a poem or book of your own about your family’s Thanksgiving fellowship. I can see us reading this each year during the Thanksgiving season. What have you been reading lately? New books? Old favorites? This entry was posted in Book Reviews, Books, Preschool, Read alouds and tagged Books, literature, preschool, reading by sweetie. Bookmark the permalink.